Hudac, C.M., DesChamps, T.D., Webb, S.J., & Bernier, R.A. (May 2016). 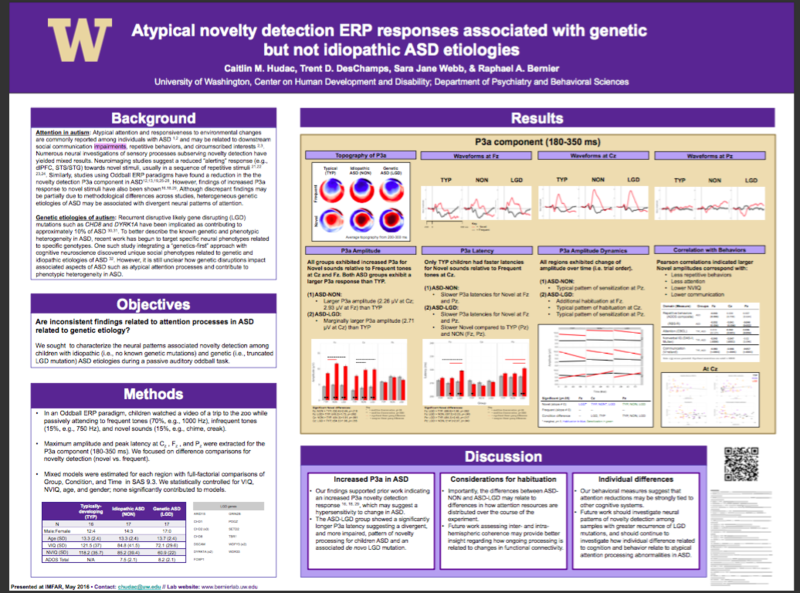 Atypical novelty detection ERP responses associated with genetic but not idiopathic ASD etiologies. Poster presentation at the annual International Meeting for Autism Research (IMFAR) in Baltimore, MD. Fox, E.F., Thompson, M., Ward, T., Gerdts, J., & Bernier, R.A. (May 2016). 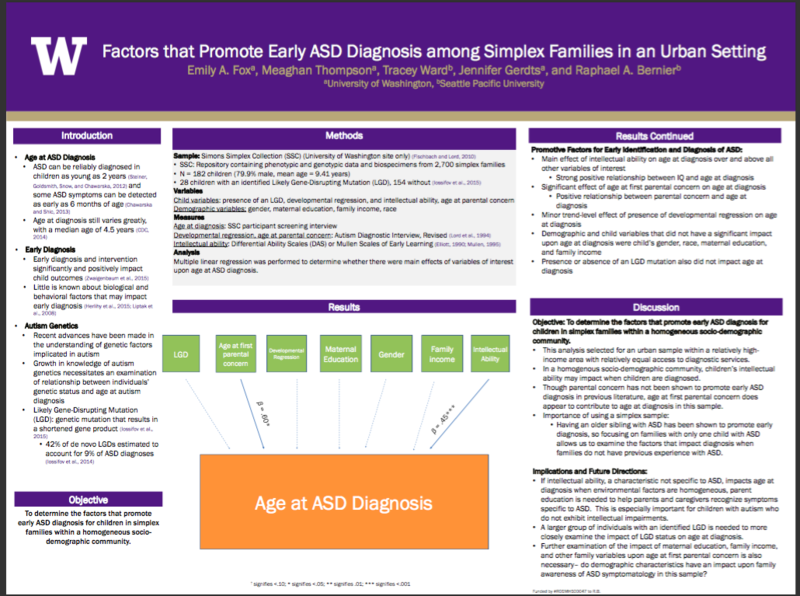 Factors that Promote Early ASD Diagnosis among Simplex Families in an Urban Setting. Poster presentation at the annual International Meeting for Autism Research (IMFAR) in Baltimore, MD. Gerdts, J., Mancini, J., Ward, T., Trinh, S., Thompson, M., Rhoads, C., Oshiro, K., Han, J., & Bernier, R.A. (May 2016). 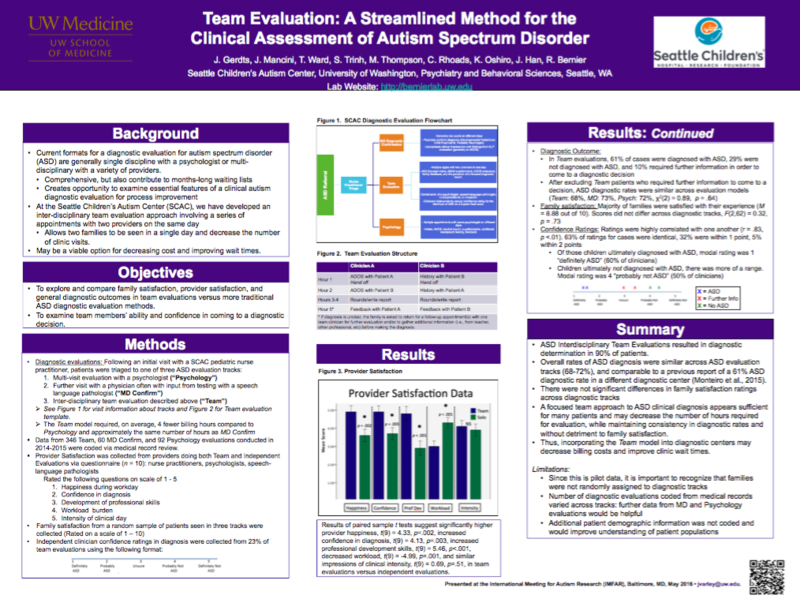 Team Evaluation: A Streamlined Method for the Clinical Assessment of Autism Spectrum Disorder. Poster presentation at the annual International Meeting for Autism Research (IMFAR) in Baltimore, MD. Trinh, S., Goin-Kochel, R.P., & Bernier, R.A. (May 2016). 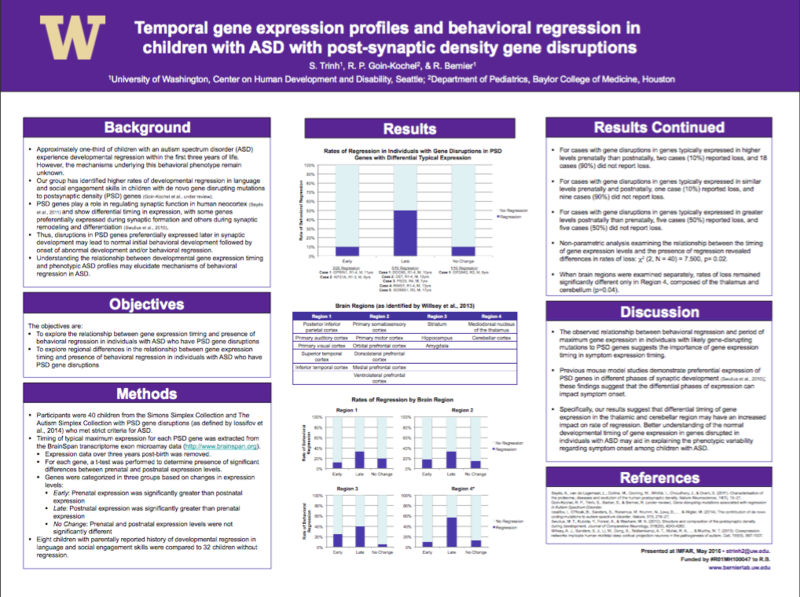 Temporal Gene Expression Profiles and Behavioral Regression in Children with ASD with Post-synaptic Density Gene Disruptions. Poster presentation at the annual International Meeting for Autism Research (IMFAR) in Baltimore, MD. Earl, R.K., Hudac, C.M., Gerdts, J., Elchier, E.E., & Bernier, R.A. (May 2016). 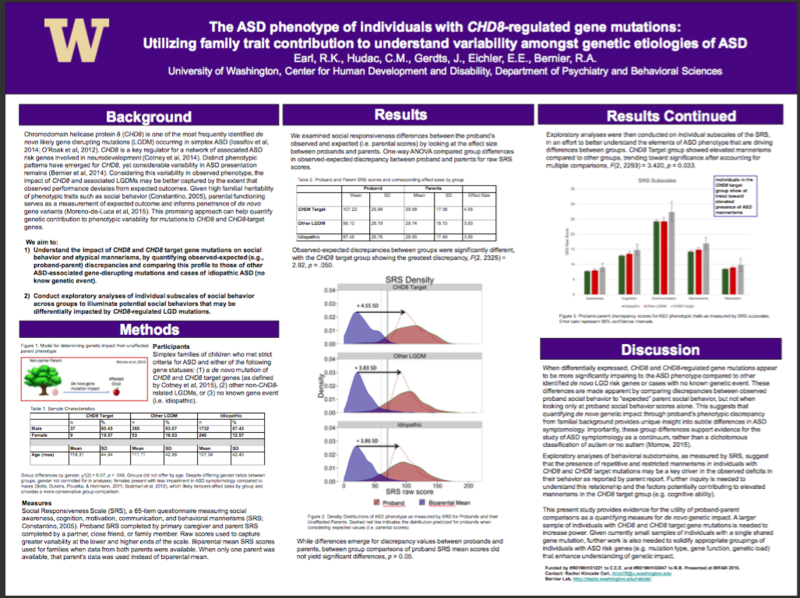 The ASD phenotype of individuals with CHD8-regulated gene mutations: Utilizing family trait contribution to understand variability amongst genetic etiologies of ASD. Poster presentation at the annual International Meeting for Autism Research (IMFAR) in Baltimore, MD. Han, J., Wolken, A., Barber, S., & Bernier, R. (May 2016). 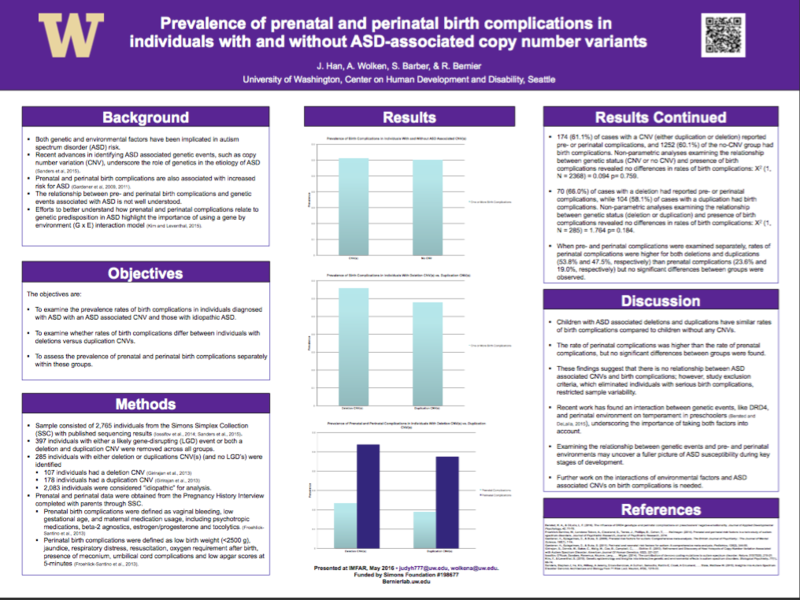 Prevalence of prenatal and perinatal birth complications in individuals with and without ASD-associated copy number variants. Poster presentation at the annual International Meeting for Autism Research (IMFAR) in Baltimore, MD.